This is one of our greatest production challenges. This precision piece of Magic defies logic. 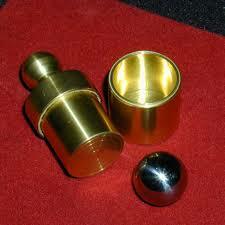 A beautiful brass plunger, a brass cup and a steel ball make up what is now a classic piece of Magic. The performer displays a solid brass plunger and a solid steel ball. The ball is dropped into A brass cup, which is resting atop the back of the performers hand. The plunger is used to press the ball flat...or so they think. The plunger is removed and the ball has vanished!, only to appear moments later as it falls through the performers hand! This may read simple but the effect on your audience is staggering. This is just an impossible feat! Collectors have been snatching them up for their beauty and future value. Hand polished and fitted for beauty and precision.